This product had been needed for a long time, and we made it happen years ago, rest assured this bearing performs. A press-in replacement for the rear knuckle where the lower control arm mounts. 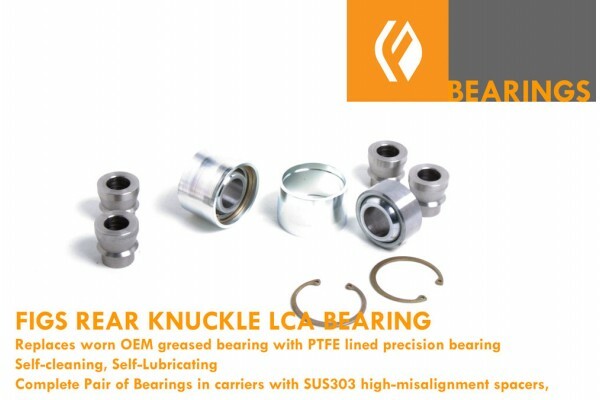 While the stock bearing has rubber boots, these feature a Teflon lined FK spherical bearing for highest strength and long term use on the track or dual purpose vehicle. We have tested these bearings in track duty so you know you are getting the highest quality solution. The bearing is self-cleaning and self-lubricating so boots are not needed, so they as we have found they just seem to trap in contamination. Set includes 2-Bearings in bearing cups with retainer clips and stainless High-misalignment spacers to replace BOTH sides. A bearing service tool (large C clamp) with cups for both sides is suggested since the bearing will need to overtravel to be centered in the knuckle. Install: Covered in our blog. Remove old bearing via any means possible. A heavy bearing service tool is suggested. *NOTE only press on the outer cup section, never the bearing center. For easier installation freeze the bearing and heat the knuckle slighlty with a heatgun or torch. Inspect to make sure there is no binding in the bearing motion. 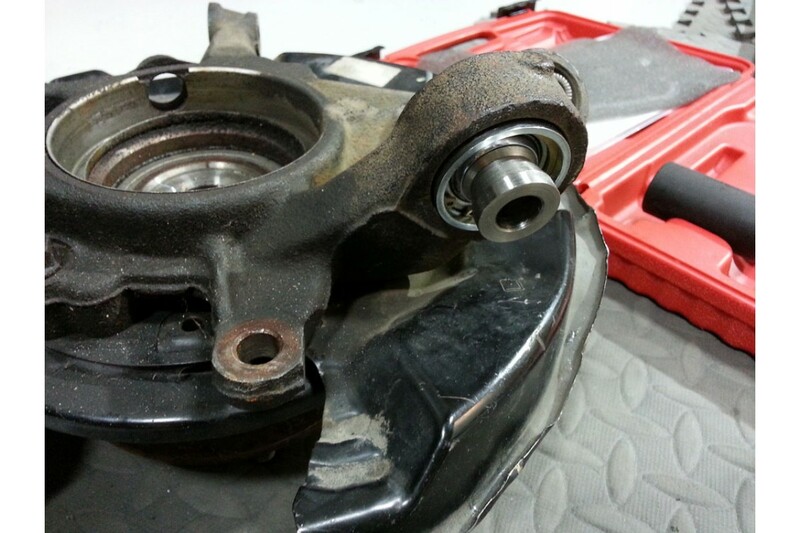 If low speed stiction is present, lubricate the bearing with a DRY FILM teflon spray.